Audacious Orchestra is not running during our Fall 2018 semester. Please let us know if you’re interested in joining a group like this. The Audacious Orchestra is a unique and exciting classical music ensemble specializing in a wide variety of Western art music written or arranged for string orchestra. The group blends young musicians of varying ages and skill levels in a way that challenges everyone. A special feature of this group is the integration of two distinct entities into one performance ensemble, bringing string players from throughout the region who have a wide range of skill and experience together to play great music in a relaxed, yet dedicated, atmosphere. The larger ensemble is led by a conductor, and breakout sessions for older players with advanced skills offer a chance to learn to play as a group without a conductor. The group is collectively known as the Audacious Orchestra. Our arrangements are unique, and allow students who have only played for a couple of years to be able to collaborate with those working on advanced repertoire. The technical expectations for joining the full ranks of the Audacious Orchestra are equivalent to that of Suzuki book 2. If you are not sure if you are ready for this skill requirement please contact us. We can figure it out by talking to you or arrange a time to meet so you can play for us. A subset of extremely skilled high school age players within the Audacious Orchestra is known as the Audacious Chamber Orchestra (ACO). Admission to this group is by audition only; members are expected to perform at the highest level of musical interpretation and artistry. Each musician in the group is encouraged to contribute to the rehearsal process, and has equal say in selecting repertoire and planning performances. Please contact us for information about our audition schedule and requirements. 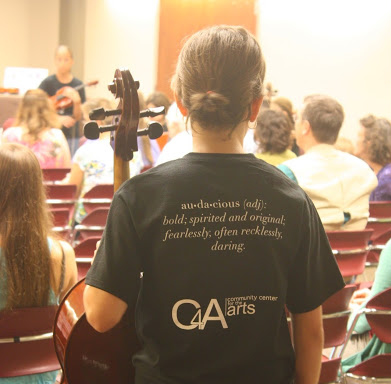 High school age players who do not play at advanced levels but still want to participate in the group are welcome to join the full Audacious Orchestra. The Audacious Orchestra and Chamber Orchestra perform multiple times throughout the year. Our performance venues have included: The Urbana Free Library, Pizza M, McKinley Memorial Presbyterian Church, Good Shepherd Lutheran Church, the Chapel of St. the Divine, the Urbana Farmer’s Market, and the Urbana Holiday Market. Some of our recent repertoire includes: a Vivaldi Violin Concerto, Grieg’s Holberg Suite, and Handel’s Water Music. Mondays, 5:30-8:30 PM. Times overlap for smaller and larger group potential. This group is for bowed string players who play at an intermediate through advanced level. You must audition for acceptance into the Chamber Orchestra. Please read below for audition details. Your audition should consist of two contrasting solos that demonstrate your current level of playing. To schedule an audition, email Amanda Ramey.